Flowserve is the world’s leader in the design and manufacture of corrosion resistant fluoropolymer lined valves. 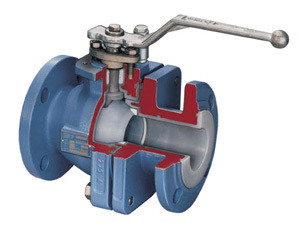 Flowserve Atomac valves provide bubble-tight shutoff, low maintenance, no-leak stem seals and the safety assurance of a blowout-proof stem assembly. For performance, safety and reliability, Atomac is the valve of choice. AKH2 Full Port Minimizes pressure loss and increases flow capacity to reduce energy and pumping costs. 1/2 in (15 mm) through 12 in (300 mm). DIN dimensional only: not available to ASME dimensions. Thick liner 100% inspected at 20,000 VDC for defects is made from highly corrosion resistant FEP to 300°F (150°C) or PFA to 400°F (200°C). A variety of metallic and non-metallic ball material options are available. Ductile iron body sections (ASTM A395 60-40-18) with high strength B7 fasteners are both rugged and rigid. AKH lined valves are now available with CF-8M stainless steel body armor, ball and stem inserts.